When it comes to Radical Skincare you probably have realized I have nothing but love. After all, I expressed my love here and here. Literally everything I have tried has been UNBELIEVABLY AH-MAZING- ok Jamie cool it with the CAPS. But in all seriousness, everything about this brand is #rockingmyworld. So today I am bringing you my current lust that is ongoing in my Radical Skincare love affair. 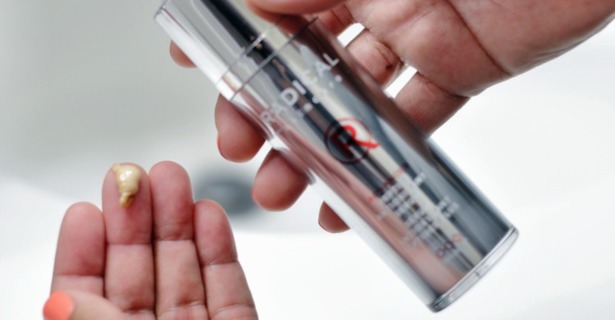 The Radical Skincare Advanced Peptide Infused Antioxidant Serum*- $190 USD, is full of heavenly goodness. Full of tripeptides, green tea, resveratrol, sodium hyaluronate and their patented trylacel- to learn more about trylacel click here. Now you’re probably wondering what is all this and what does it do? The combination of all these ingredients helps combat 16 agents that cause: poor/low hydration, deterioration of cell regeneration, the slowing down of collagen synthesis, nerve transmitter inhibition, pigmentation disorders, poor cellular respiration and much more. In simpler words it helps combat the signs of aging all while repairing the past damages of the skin. One word. LOVE! So after six weeks going on seven weeks of using this product, I can honestly say I am IN LOVE with this product. Another Radical Skincare win, in my stash. The price is a bit steep at $190 USD, however for me when it gives results- it is worth it. At first I was thinking ‘ya right, this stuff is not going to do much’, especially even though I am concerned with fine lines and wrinkles it is not my biggest concern since I don’t have many. My concern was pigmentation healing since I of course use to be an avid picker- ok I wont lie on occasion I still am- I am working on stopping. But that is besides the point, this stuff has helped my skin immensely. OMG- my skin is soooo much more luminous and smooth. It is soft like baby skin soft. I have been used this in the morning after cleansing and toning, before my daily moisturizer. And again at night time after cleansing and toning but before my facial oil. My skin is loving this stuff, and has not broken out at all because of it. Like the results of this product states: skin has increased hydration and comfort, skin is better prepared to benefit from all other treatments, less wrinkles and reduction in wrinkle depth, improved skin firmness and density, firmer skin with better defined contours and a more even clear complexion. Now I can’t truly attest to the reduction in wrinkles cause like I said I don’t have too many quite yet. But I can truly say that my skin is glowing, it is clearer and for sure hands down more firm. I even had someone tell me that my skin looked amazing and it was glowing- love great compliments. All and all I am obsessed with this product, and even at $190 USD I will be repurchasing this baby. I already have my eye on a few more Radical Skincare products from the Brightening Serum to the Skin Perfecting Screen SPF 30- it looks quite dreamy. One product. One serum. For all skin types. For all ages. What can I say: luminous, bright, smooth skin- I am coming for you. Radical Skincare I think I am in love….. This article comes from the blof Makeup Life & Love, thanks Jamie!